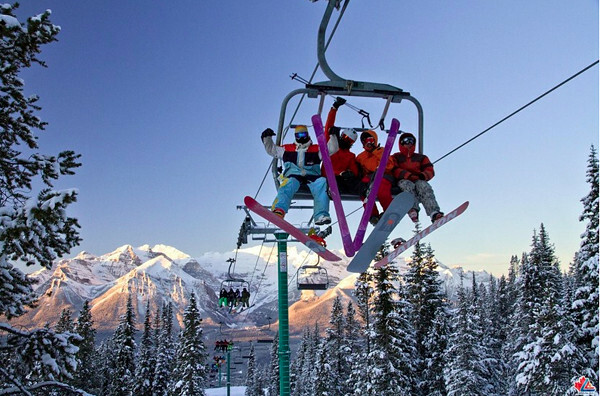 Banff hopped into ski season this past weekend with big smiles on the faces of skiers and riders. [R368R, Lake Louise] fired up two lifts on Saturday, starting up daily operation, and [R802R, Mount Norquay] opened for the weekend. At Lake Louise, the excitement prompted some skiers and riders to line up hours before the lifts opened at 9 a.m.—all with the aim of grabbing first tracks. “We had a whole bunch of people line up by 6:30 in the morning. They might have been there earlier, but that’s when our operations team came in to work,” Spokesperson Mike Moynihan said. Opening day excitement at Lake Louise this past weekend was driven in part to La Niña forecasts. Photo by Chris Moseley. Courtesy of Lake Louise. Twenty-five centimeters of fresh snow earlier last week added to the mood, and bluebird skies lit up the rugged Canadian Rockies surrounding the resort. The resort opened two lifts and four runs. Three features on Easy Street included a 40-foot box, a medium down rail and a ground box with a small jump. 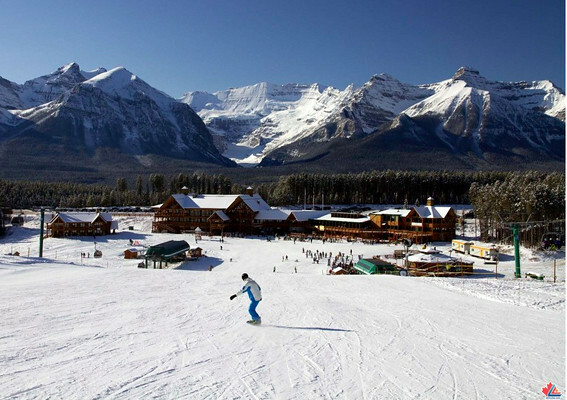 Bluebird skies prevailed for opening weekend at Lake Louise. Photo by Chris Moseley. Courtesy of Lake Louise. More lifts and more terrain will open as soon as snowfall and snowmaking allows. Snow flurries are in the forecast for this week. Currently, lift tickets are half price during early season. Rates will go up as soon as more terrain is open. Lake Louise plans to operate daily from now through May 6. Mount Norquay also opened one chair for the weekend. The ski area will continue to run the Cascade lift on weekends until Dec. 2, when the ski area bumps up to full operation.